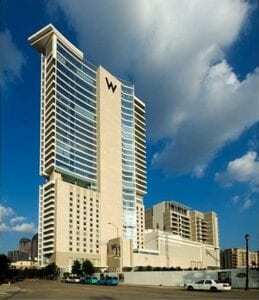 W residences condos are located in Dallas Victory Park, and one of the most beautiful high- rises in Downtown Dallas. Enjoy breathtaking views, and luxury amenities such as the 16th floor zero-edge infinity pool, access to an up-to-the-minute fitness center for health and a spa that provides some intense pampering. Living at W Residences condos in Dallas provides round the clock security, limited access to the building for peace of mind. The 24 hour concierge service offers whatever and whenever for the residents desire. The neighborhood around Victory Park offers a variety of options for all leisure and entertainment. Whether it is biking, walking on the Katy Trail, or watching the Dallas Mavericks play, or shopping, there are all kinds of things to enjoy just steps away. This modern high-rise at W residences is all about lavish designs and breathtaking views.